Harvested garlic scapes are good keepers. They come into the garden all at once and must be cut so that the plants’ energy concentrates on making the garlic bulbs grow large and plump. 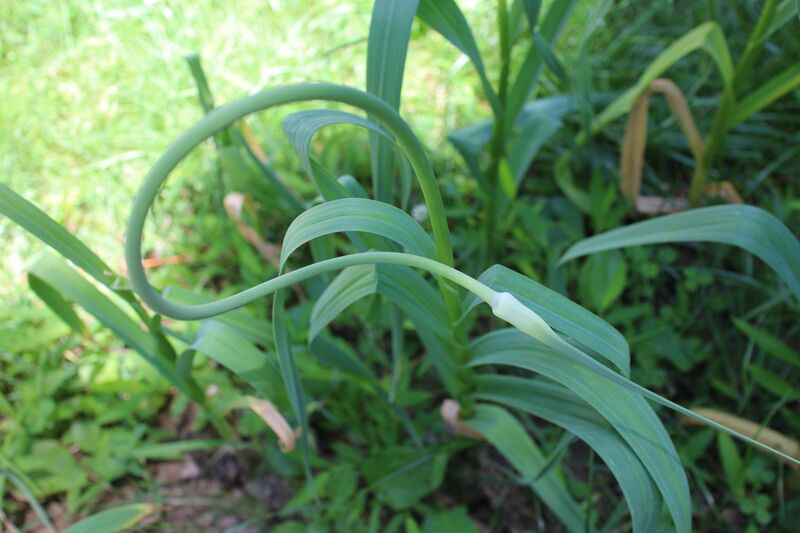 Scapes are the stems of hard neck garlic that shoot up to form flowers and seed heads, and become green curlicues in the process. Once cut, they can linger raw in the refrigerator for weeks and, when made into pesto, stored in the freezer for a year. We grow lots of garlic organically (3600 heads on our farm and 80 in our in-town home garden, the experimental base for the farm). They have exotic names and varying characteristics: Music (a small, pretty Porcelain), Georgia Fire (also a Porcelain, packs a punch), Belarus (early, lovely), German Extra Hardy (name tells it all), Red German and Red Chesnok (stalwarts, one a Rocambole type), Turkish Giant (really not so big), Elephant (really big), and another one we just call “Soup” since we’ve been growing it for years but don’t know its name, only that it started organic and still is. I have a few additional varieties in mind for another year, but we tend to replant what we’re growing. 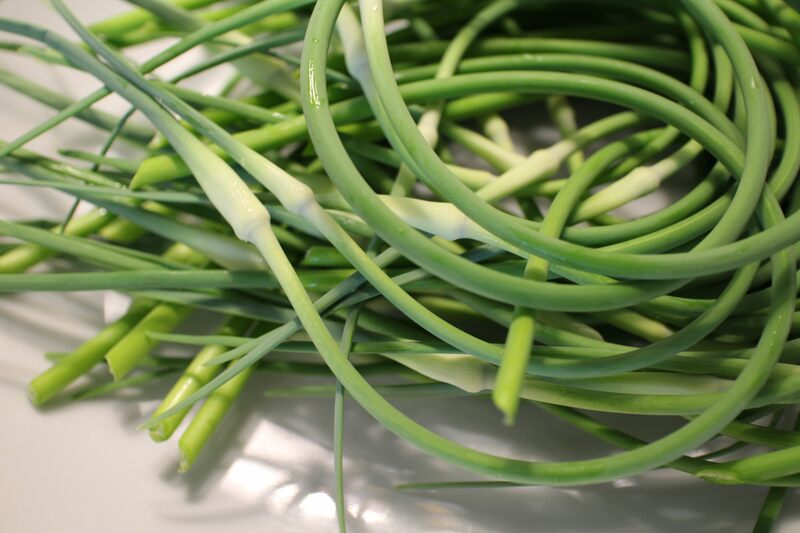 Meanwhile, so far this year, we’ve harvested over 40 pounds of scapes. I know I’ve claimed that I love a glut, but this is over the top. My current favorite use of garlic scapes is to give them away. 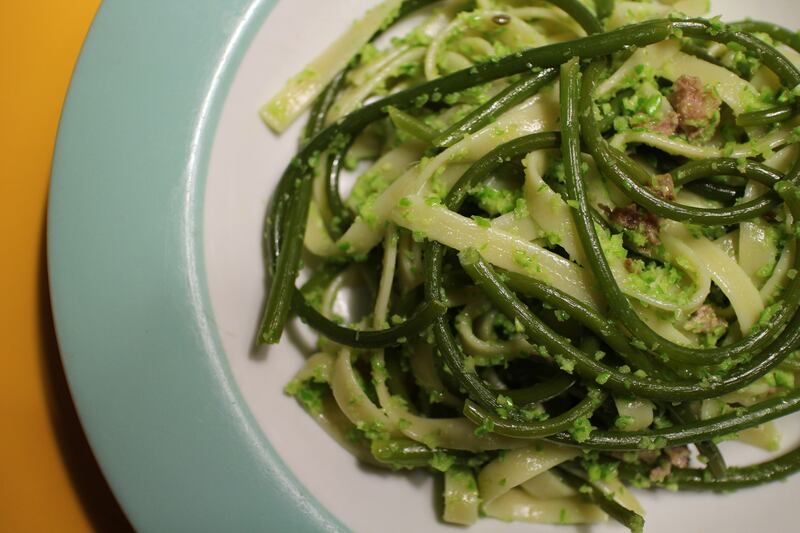 Garlic scape pesto, the way I make it, is simple. After snipping off the flower ends, the bean-like scapes go into the food processor with a glug of olive oil and a healthy pinch of salt, and are ground (scraping the bowl a couple of times) into a smooth or coarsely textured base. This can be packed into a container – tightly to remove air – and frozen. Or it can be tossed as is into pasta or rice or potatoes or other vegetables, combined with sour cream or Greek yogurt and a little honey for a sauce or dip, stirred into soup, combined with ricotta cheese to stuff pasta, and so on.Garlic scapes also are as versatile as green beans when cut into manageable lengths and steamed or roasted. For those of us who adopt a waste-not-want-not or eat-the-whole-thing attitude, garlic does not disappoint. Here, I combined pasta with garlic scape pesto, sautéed Italian sausage and steamed scapes.